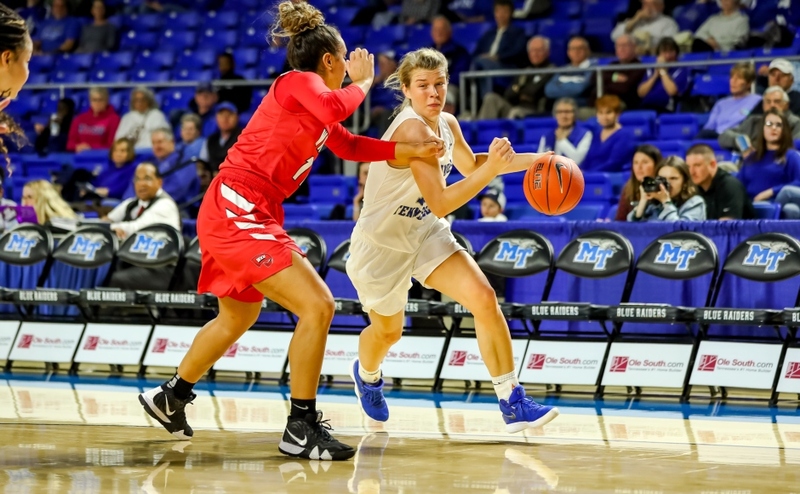 The Middle Tennessee State Lady Raiders (22-10, 13-6) made a deep run into the Conference USA Tournament over the weekend. The Lady Raiders held the third seed going into the tournament and strung together two wins to secure a spot in the C-USA title game against Rice. 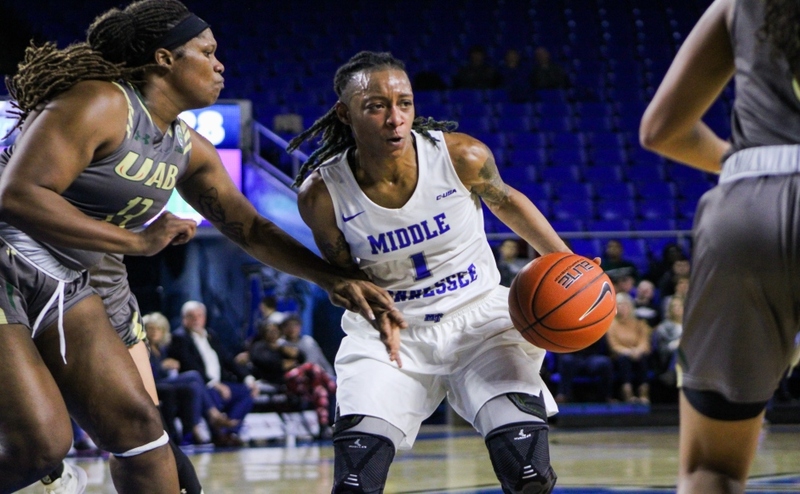 MTSU played a game against Rice in the regular season that ended in a defeat, and the Lady Raiders could not turn the tide in their rematch with the Owls, despite senior Alex Johnson’s 27-point performance. Their road to the championship game featured matchups against the Univserity of Texas at El Paso and University of Alabama-Birmingham. MTSU dominated from the opening tip on Thursday against the Miners. The Lady Raiders hit the first three buckets by either team and jumped out to a quick 6-0 lead. 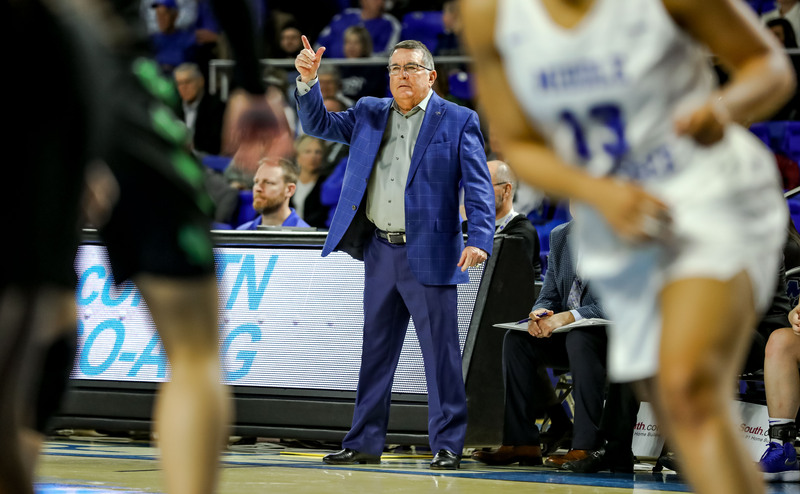 MTSU put on an incredible performance defensively, and it’s an area head coach Rick Insell takes pride in having his players excel at. MTSU was able to hold the Miners to just 26 percent shooting from the floor in the game. They guarded the perimeter at an elite level, forcing the Miners to take jump shots from 3-point range. UTEP shot 15 three’s in the game but only connected on three. Before the end of the first quarter alone, the Lady Raiders held a double-digit advantage. Johnson led the team with 17 points in their first round of play after having a bye from being a top four seed. Offensively, the Lady Raiders shot 43 percent from the field and were exceptional at the charity stripe, going 10-for-11 on free throws. MTSU was able to coast to victory in dominating fashion, 66-44. 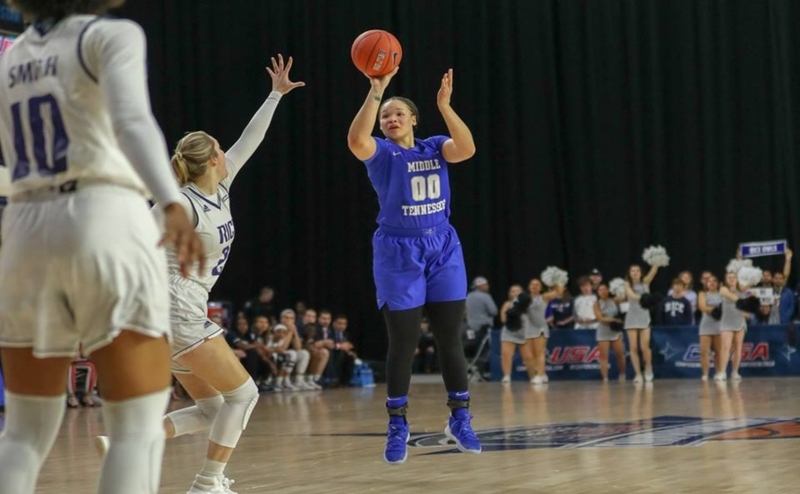 The Lady Raiders returned on Friday took care of business in the semifinals against the Blazers to advance to the C-USA Championship game by way of Hayes’ 34 points. MTSU was able to hold a double-digit lead for a majority of the game and finished with a 10-point victory, 75-65 over UAB. MTSU managed to shoot even better from the field in their second game and were deadly from beyond the arc. 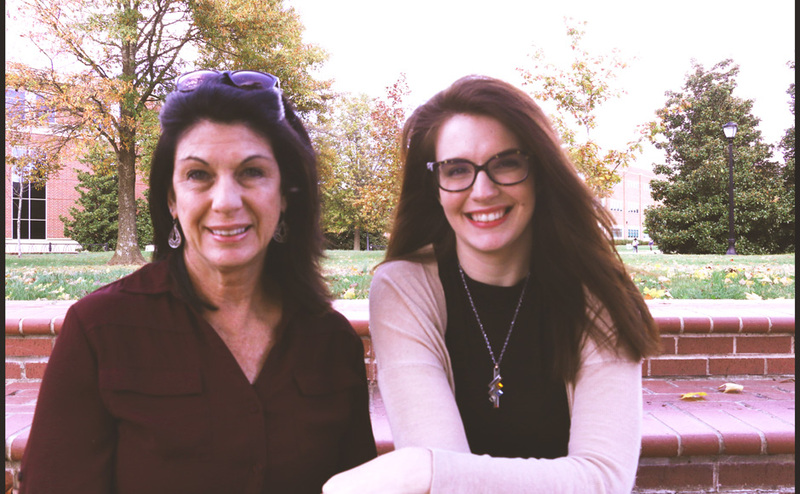 Everything was falling, as they connected on nearly 65 percent from deep. Holding a 10-point lead going into the fourth quarter, the Lady Raiders were able to extend it to a 15-point lead at one point. The Blazers were able to cut it back down late but only due to fouls. UAB fouled the Lady Raiders late to try and stay alive, but the dagger came from Jess Louro with just over a minute to play. She drilled a 3-pointer and put the lead out of reach, and the Blazers ran out of time for a comeback. 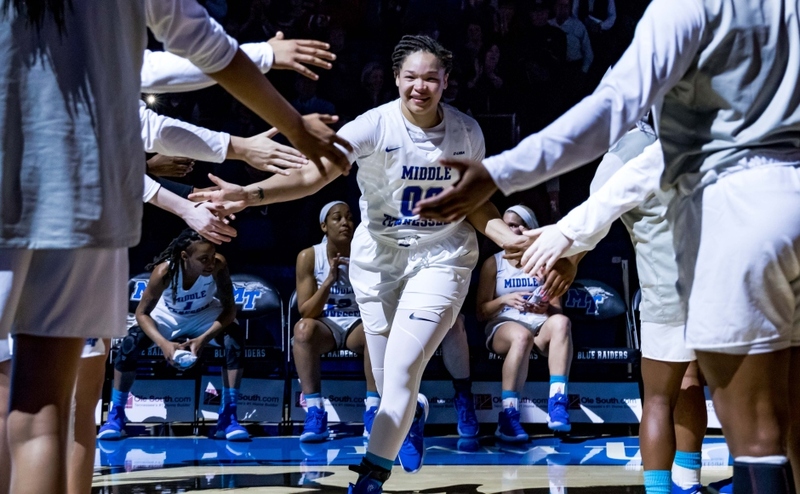 On Saturday, the final day of the tournament, MTSU met the number one seeded Rice Owls in the championship game,but went cold down the stretch and couldn’t capture the C-USA title. The Lady Raiders held the lead the entire first half, but in all sports, it’s not how you start but how you finish. The Owls were able to finish late in the game and hit big shots to propel them to victory. The Lady Raiders started blazing hot from the field in the first half. They shot at a 48 percent clip and hit five 3-pointers. However, they couldn’t sustain their momentum and script completely flipped in the second half. For the remainder of the game, MTSU was 9-29 on shooting and only managed to get up three free throw shots. The Lady Raiders settled for jumpers and didn’t attack the interior. The Owls on the other hand were 83 percent from deep in the second and had 15 free-throw attempts and only missed one. Their aggressiveness was the difference in the game and allowed momentum to swing. MTSU was then forced to foul late and tried to save their season, but it wasn’t enough. Despite a 15-point loss, 69-54, it was much closer than the final score might have suggested. It was a tough pill for the Lady Raiders to swallow after an incredible season. Johnson and Hayes were named members of the All-Tournament team. The Lady Raiders will return to action in the Fall of 2019. There will be sweeping changes for the starting lineup next season due to three starters and one key rotational player in Katie Collier graduating in the spring.